If you’re on Instagram, we’re running a contest to win a grab bag of FREE STUFF. 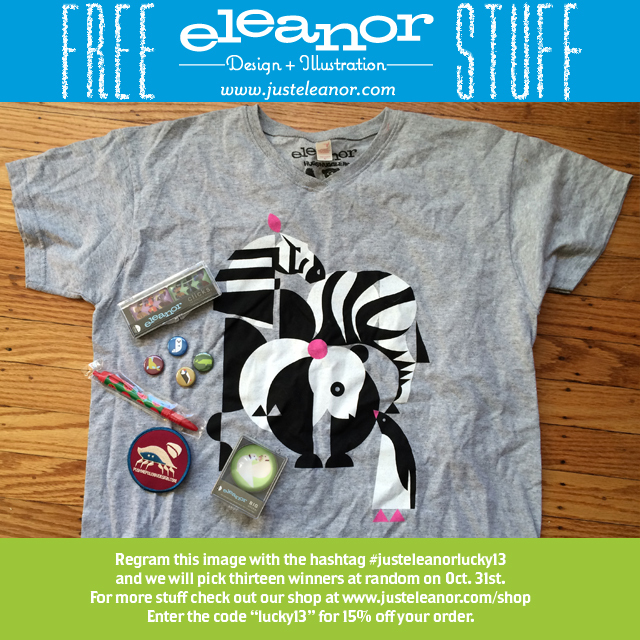 If you “regram” this image with the hashtag #justeleanorlucky13 you’ll be entered for a chance to win one of thirteen bundles that include a t-shirt, magnets, pins, patches, and a scratch ‘n’ sniff pen. The winners will be chosen on October 31st so act now! If you’re not on Instagram, don’t fret, you can still shop at our store and receive 15% off of your order by entering in the code “lucky13” at checkout. The coupon code is valid up until November 15th. I know, kinda scary good, right? This entry was posted in Uncategorized and tagged contest, freebies, instagram, promo, scary good on 10/27/2014 by admin.